FEBRUARY 27, 2017 IS IT IMPORTANT? MAKE IT BOLD! Speaking now as a 70-year-old, I must admit that as we get older it's harder to read the fine print. In my opinion, some fonts are too small on the TV graphics that my colleagues and I are asked to prepare. Here's an example from Turkish television. If you were watching but not on an HD screen, could you decipher the line under telefon interviewee Ertugrul Saglam's name? It identifies him as "Bursaspor Teknik D." or manager (Direktörü) of the soccer team Bursaspor. When fellow septuagenarian Warren Beatty took the stage last night to present the Oscar for Best Picture, PricewaterhouseCoopers mistakenly gave him the wrong envelope  a duplicate of Emma Stone's envelope for Best Actress in La La Land. He opened it (left) and stared at the card, baffled. He looked to see whether there was another card inside. Faye Dunaway looked at it, saw the movie's name, and proclaimed La La Land to be the Best Picture winner. Wrong. It was Moonlight. Why had no one noticed that Beatty had the wrong envelope? I say it's because, in an attempt to be elegant, it was labeled with too small a font inside a tasteful rectangle (center). These glamorous people in their gowns and tuxedos aren't wearing their reading glasses! I suggest the letters should be as big as possible (right). Gary Natoli, the veteran Oscars stage manager who was in the midst of the chaos on Sunday night when La La Land was mistakenly announced as Best Picture, told TheWrap on Wednesday that the two PwC accountants entrusted with the envelopes froze when things went wrong. In fact, he added, the stage crews complaints had led to a change in the inserts that went inside the envelopes, which originally had print that was far too small. But they couldnt do anything about the envelopes themselves, on which the name of the category was not nearly as legible as it had been in previous years. And Benjamin Bannister describes how the cards inside the envelopes still needed further improvements to their typography. Many of us seem destined for one career until we graduate from college and then head off in a completely different direction. I earned a degree in physics and then went into television production. Here's another example from my younger days. "One Hundred Men and a Girl" was the intriguing name of the marching band at Syracuse University. 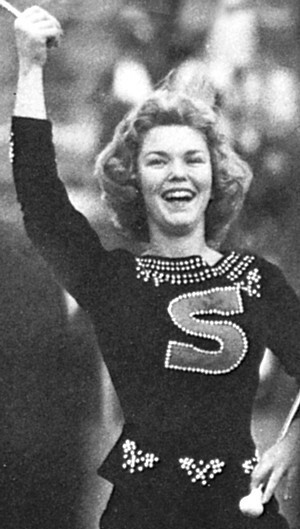 It described the organization from 1947, when the first Orange Girl wore a spangled costume while twirling her baton to the music, until 1966, when females were also allowed to play instruments. The band has been co-ed ever since, but it's still fronted by an Orange Girl. During college football's centennial season in 1969, I was a Syracuse grad student. I attended a few football games, including a memorable loss to Penn State. But while the band was on the field, we males in the Archbold Stadium stands kept our eyes on the shapely young lady, of course. 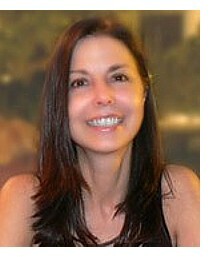 The Orange Girl that year was Colette Daiute (below), a Spanish major from Paramus, New Jersey. Above: from the Daily Orange. Below: from a current website. I recall one time when a photographer found an excuse to ask her a question, presumably about which end of the field the band was headed for next. And at one game, the girl with the long brown hair was among the finalists for homecoming queen. 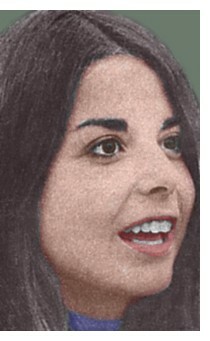 Colette was interviewed by the Daily Orange for a November 1969 article about a local mayoral election. I found that issue recently, colorized the striking photo (at left), and decided to do a little additional research. It turns out that Miss Daiute had been Miss Teenage America of 1966  winning the title over Miss Teenage Memphis, Cybill Shepherd. She modeled for an ad in Teen Magazine and made an appearance on the Patty Duke Show. But she was much more than a beauty queen and baton twirler. After graduating from Syracuse in 1970, she earned a doctorate in education at Columbia. She was a faculty member at the Harvard Graduate School of Education from 1983 to 1994, when she became a professor of psychology at The Graduate Center of The City University of New York. Along the way, she married Mr. Wright (first name Patrick). At CUNY, her research "focuses on social development, in particular to create new theory and research methods for gaining youth perspectives about their relationships and the role of institutions (including education and health care) in their lives," according to the university. "Dr. Daiute has recently completed a large study on children's understandings of social conflict in the context of a violence prevention program, culminating in numerous publications written with student research assistants." Her most recent book is International Perspectives on Youth Conflict and Development (Oxford University Press, 2006). Students who maintain unreflective and uncritical views of technology may not realize that although learning word processing skills can ultimately be useful for getting a job, using word processing to express their own views and to connect with other like-minded youth in an organized manner is a way to become active members of society. You can't stereotype a book by its cover. You hit the bottom of the net. 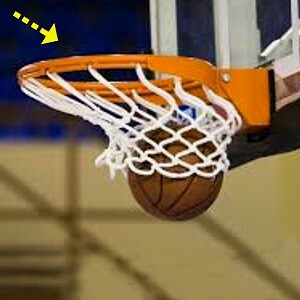 Nothing but net! Way to go, buddy! 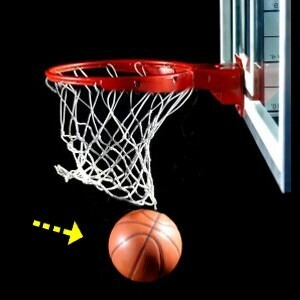 Swish! So your team won, right? FEBRUARY 23, 2007 REMEMBER THIS? I found this old photo in a 1963 edition of my hometown newspaper, the Richwood Gazette. It's an aerial view of the main intersection in that Ohio village, looking east-northeast. Franklin Street, running from left to right, is crossed by Ottawa Street. 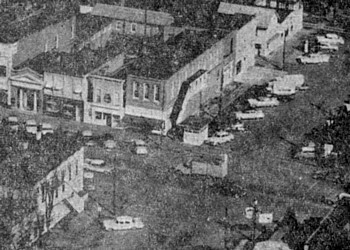 Do any of you long-time Richwood residents remember the little white cube-shaped building with the black roof in the center of the photo? It was the police station. 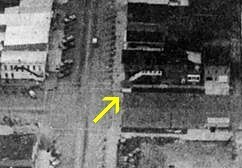 Like the control tower at an airport, it was elevated so that an officer could look out windows on all four sides and see what was going on for several blocks on both Ottawa and Franklin. If necessary, he could scamper downstairs and hop into his patrol car, parked right there. Greg Ballinger found another photo, undated, looking north. I recall that the police department's phone number (2422) was painted in black on that white wall. As a boy in the 1950s, I thought it was uncomfortably close to our home phone number (2244), but we never seemed to get any emergency calls by mistake. I take the Constitution of the United States literally. I'm stubborn that way. The 13th Amendment states, Neither slavery nor involuntary servitude, except as a punishment for crime whereof the party shall have been duly convicted, shall exist within the United States. When the government compels me against my will to serve on a jury, is that not involuntary servitude? When, in times past, the government drafted young people to serve in the military, was that not involuntary servitude? I suppose there must be a loophole somewhere. And then there's Article 8, which gives Congress the sole power to declare war. Congress has not exercised that power since 1941. Yet we have been involved in numerous conflicts since then, and our present President [George W. Bush] has declared that we are at war against terrorism. Other Presidents have "declared war," but in a metaphorical sense, as in the War on Poverty and the War on Drugs. These "wars" were large-scale efforts to diminish particular evils. Everyone realized that they would never achieve total victory. We can't eradicate all drugs, and the poor will always be with us. We can only try to make the poor less poor and drugs less pervasive. Properly understood, the War on Terror is in this category. As long as one disgruntled person knows how to make a bomb, terrorist tactics will be a possibility. We can only try to make terrorism less likely. However, our present President has implied that the War on Terror is a real war, a conflict against an identifiable foe who can be forced to surrender. He admits that winning the War on Terror may take many years, but in the meantime he is a wartime president, authorized to restrict civil liberties in his role as Commander in Chief. His supporters have impugned the patriotism of anyone who would question the President's actions in time of war. They imply that this Presidential immunity from criticism ought to continue for the duration. But the duration of this "war" could be centuries. I'm stubborn enough to maintain that we are not at war unless Congress formally declares it. Exactly seventy years ago, I followed his recommendation! 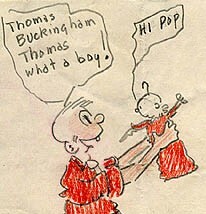 In celebration of my birthday, today has been declared a national holiday  Thomas Buckingham Thomas Day. For more baby pictures, see this months 100 Moons article. It has my footprints all over it. At idle times, my mind sometimes shelves the problems of the day and instead proposes solutions to old problems. The old matters no longer matter, but they still haunt me in dreams. One day about 30 years ago, we were taping the weekly About Washington in our cable TV studio. For the second half of the half hour, Jerry Polen was interviewing a woman who had brought her young child to sit on her lap. The boy was restless, and as the interview progressed, she struggled to keep him in place. Finally the kid slipped off her lap and toddled off to explore the studio. He saw a microphone cord attached to his mother. He followed the cord to the wall and unplugged it. That was it. I had to come out of the control room, stop the taping, and plug the mic back in. (I think I frightened the child, and he spent the rest of the session on his mother's lap, sucking his thumb.) I told Jerry we'd have to start over again from the previous commercial break, so he'd have to redo the interview from the beginning. "Can't we pick it up in the middle and make an edit?" he asked. I had to tell him no, that our videotape equipment wasn't capable of making edits with any kind of precision. Last night, as I once again rehashed this incident in my dreams, I realized that it could be handled differently nowadays. In my dreams, I still have to type up the program logs, and we're still taping About Washington every week, in the traditional black and white, but now we have up-to-date recorders  digital, probably  with edit capabilities. And then I dreamed of other improvements. 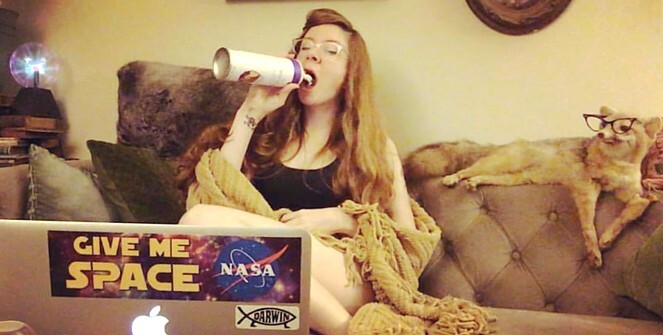 How about adding a studio audience? The cable studio isn't big enough, so maybe we'll go on location to a small auditorium at the local college. Our multi-camera switching gear, problematic in 1977, can no longer leave the studio. But now that we can edit, we can simply record each camera separately and then cut the shots together afterwards. (I've seen some musical performances on YouTube that obviously were recorded by a stationary camcorder on a wide shot, with closeups from a handheld camera inserted into the proper places later.) Maybe when About Washington goes on location, we can supplement our usual two cameras (one on Jerry and one on his guest) with a stationary "master shot" of the entire stage. That's assuming that we can find three cameras and three recorders. Let's see, we'll want to pick a fixed time and day of the week for the taping so the audience would know when to show up . . . .
Several years ago I dreamed that my job was to direct another program from this same studio. I must have been thinking of 1970, when my boss recruited regionally famous Sally Flowers to host a morning show and assigned me to direct. In this dream, the boss had worked a deal with David Letterman to stop by and tape a weekly hour, because our studio was on his way home. (Each weekend, Letterman apparently went back home again to Indiana!) Paul Shaffer came, too. Not the whole band, of course; just Paul and a keyboard. We didn't exactly know what Dave was going to do in our little studio, but my boss was sure that he'd figure something out. Dave, however, was irritable and did not seem happy to be there. In the first half of my article Fleshing Out Jesus, the apostle Paul (right) told about his visions of Christ Jesus, a supernatural being who visited earth briefly before returning to heaven. 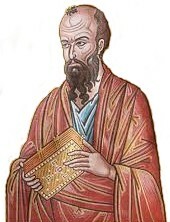 Now in the second half, the evangelist Mark suggests making Pauls ideas more accessible by inventing an allegory about Jesus Christ, an actual person who preached on earth. Click here for the second half. Remove driver's license from wallet, place in boarding pass folder. Place wallet in external compartment of carry-on bag. Move cell phone from pocket to external compartment. Move keys from pocket to external compartment. Move change purse from pocket to external compartment. Remove watch from wrist, place in external compartment. Wait in line for security check. Show boarding pass and driver's license to official. Remove laptop from carry-on bag, place in tub. Remove small bag of liquids and gels from carry-on bag, place in tub. Remove coat, place in tub. Remove zippered sweater, place in tub. Remove hat, place in tub. Remove belt, place in tub. Remove left shoe, place in tub. Remove right shoe, place in tub. Put tubs and carry-on bag on conveyor belt. Show boarding pass to official. Remove zippered sweater from tub, put it on. Remove coat from tub, put it on. Remove hat from tub, put it on. Return liquids and gels from tub to carry-on bag. Return laptop from tub to carry-on bag. Pick up belt, left shoe, right shoe, and carry-on bag. Return keys from external compartment of carry-on to pocket. Return cell phone from external compartment to pocket. Return change purse from external compartment to pocket. Return watch from external compartment to wrist. Remove wallet from external compartment. Return driver's license from boarding pass folder to wallet. Check to make sure you have everything. 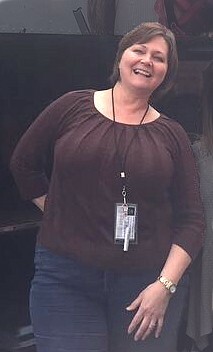 Everyone knows one of my fellow TV graphics operators as Linda P. I first worked beside her on an auto race around 1990, when she was one of the few who were proficient on a machine called the Delta. 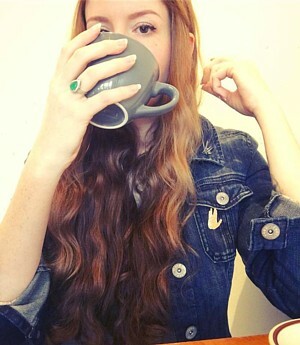 Here are two recent photos shes posted online. Duo next to me has not stopped talking about everything BUT hockey since start of game. And it's two guys! Chittychittychatchat finally talks hockey: "The Preds are so far ahead, we're putting the bench guys in. Other team is playing starters." Obviously, the guys had not yet grasped such obscure concepts as line changes. But they eventually got bored. Chittychittychatchat finally left the Preds game! 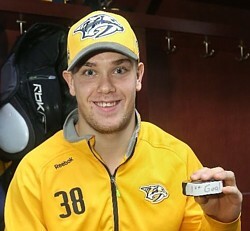 Now we need an Arvidsson hatty to salvage my night! A Viktor Arvidsson hat trick suddenly did seem possible. 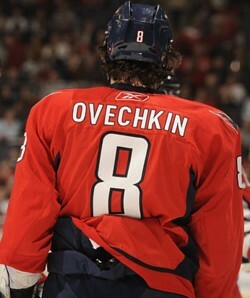 He had come into the game with only three goals in his NHL career, but already that night hed scored two. Alas, the third eluded him. 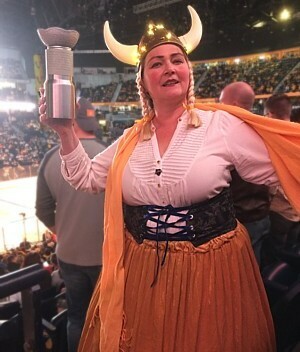 Three nights later, Linda P returned to Bridgestone Arena when Nashville hosted Washington and their star, the six-time NHL goal-scoring champion. Lady in Preds jersey next to me asks, "What's that name? Ove-Chicken?" Tracey (below) also sometimes perks herself up with a can of whipped cream. Happy Darwin Day! Peter Kalis is a Rhodes scholar who holds degrees from Oxford and the Yale Law School. 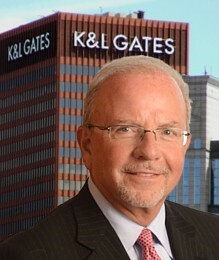 Since 1997, he has headed the Pittsburgh-based corporation known as K&L Gates. But he'll be stepping down as Chairman and Global Managing Partner at the end of this month. 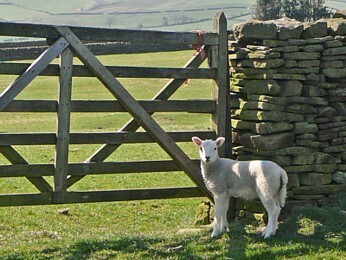 So what does K&L Gates do? It seems like they ought to market their products to farmers. Their competition, of course, would be J&R Fences. However, it turns out that K stands for Kirkpatrick. L stands for Lockhart. And Gates refers to Bill Gates father. The whole thing is a law firm that employs more than 1,800 attorneys worldwide. Therefore never send to know who let the lambs out. Notice the marked anatomical differences between the two skulls. 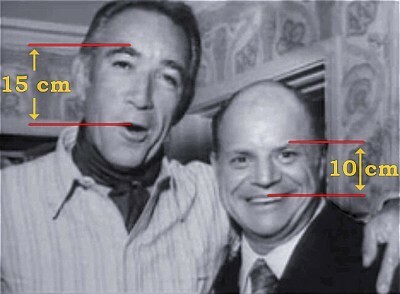 In particular, when we measure the vertical distance between the eyebrow ridge and the base of the upper jaw, one measurement is half again as large as the other. So what do you think? Could these two individuals possibly belong to the same species? I saw the above image 3½ years ago and wrote the paragraphs alongside it, but I never found the occasion to post them here. However, now theres a recent scientific article raising the possibility that human faces differ so much because were hybrids, with some Neandertal DNA in our genomes. An initial round of interbreeding  followed by hybrid offspring mating among themselves and with members of parent species  can result in animals with a far greater array of physical traits than observed in either original species, including the sizes and shapes of skulls. FEBRUARY 1, 2017 MOVE IT! MOVE IT! Ive always viewed TV programs with an eye to the technical minutia. How might the crew have done things better? 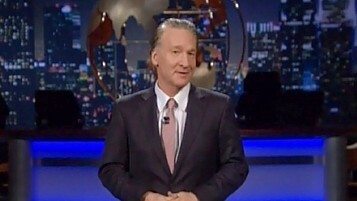 For those of you who cant watch Real Time on HBO, or dont watch because its too liberal for your taste, I can report that Bill Maher has returned for his 15th season with a new set. Seen here under construction at CBS Television City in Los Angeles, the layout looks great, but I think maybe they tried too hard. I watched the first episode on January 20. Bill opened standing in front of a backdrop B. 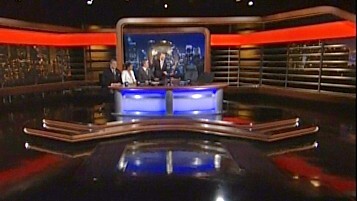 Behind it, on the far end of a movable platform P, was concealed a huge anchor desk big enough for five people. When the interview was over and the applause began, Bill said Lets meet our panel, and we did. Eventually. We saw a wide shot. The bottom of the backdrop slowly pivoted up toward us like a garage door. 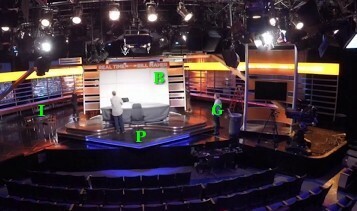 Beneath it, the platform bearing the desk began to creep downstage into the lights, in order to relocate the talking heads closer to the studio audience  an improvement over the arrangement in previous seasons. Bill took his seat at the desk. He and his guests killed time with jokes about being on a Disneyland ride. The interstitial music continued. The audience tried to keep applauding. We cut to a closeup of our host while the platform was still in motion. Finally it lurched to a halt and he could introduce the panel. I timed the whole transition at 27 seconds. Obviously, a half-minute scene change is much too long. For the second episode a week later, the backdrop had been removed. 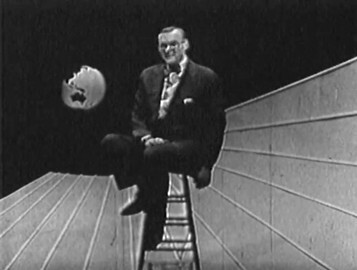 During Bills monologue, we could see the empty desk waiting behind him, with a decorative globe slowly revolving above it. Youve got to be careful with revolving globes. Im ancient enough to remember seeing another one on a show that aired from 1955 to 1958 on NBC-TV: Wide Wide World. One of Pat Weavers innovations, this was a remarkable technological feat for the new medium. A 90-minute documentary on Sunday afternoons, it originated  live  from remote locations scattered all across North America. Dave Garroway anchored. Ive heard that the audio engineers in his studio spent hours trying to track down what seemed to be a squeaking mouse until they realized the culprit was their signature globe, slowly turning in the background. Anyway, back to Real Time. Now that theres no need to lift a backdrop out of the way, the desk can start moving forward immediately at the end of the interview. Bill hops aboard and takes his seat, and the introductions can start after only 19 seconds. Another studio show I watched recently preceded the AFC championship game. Here too there was a giant desk. Every time CBS cut to the wide shot showing all five men at the desk, the camera was already in motion: trucking right to left, then left to right. Apparently the camera was mounted on a jib arm that was being waved back and forth throughout the program. Why would they annoy us like that? Well, the five men remain in more or less the same position on our TV screen while the background moves one direction and the logos on the front of the desk move the other. Our mind separates the men from the other parts of the scene, thus creating an illusion of depth. Many other shows and movies use similar camera moves (but more subtly) to make the scene come alive in three dimensions. Its much easier than requiring the audience to wear those 3-D glasses. And then the game started. 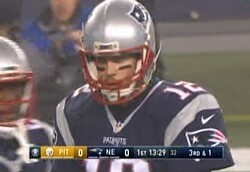 Normally Tom Brady on TV looks like Photo 1. 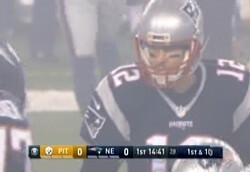 But at kickoff, a light misty rain combined with smoke from fireworks to render the first play foggy, as seen in Photo 2. 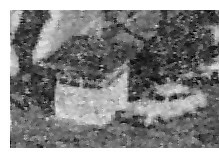 I can easily manipulate the picture on my computer, crushing the blacks and cranking the gain to obtain Photo 3. Ive often wondered why the video operators in the TV truck dont do likewise. After all, during day games they readjust cameras all the time as the action moves between sunlight and shadow. Youd think theyd want to match the cameras high in the stands to the cameras closer to the action, which achieve more contrast because they dont have to shoot through as many yards of murky atmosphere. I can think of several reasons this didnt happen. They couldnt experiment before the game to find the optimal fog settings, because the smoke appeared suddenly and dissipated almost as quickly. 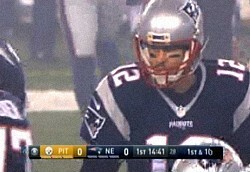 As you can see, the two shots of Brady were separated by only 72 seconds on the game clock. The fogginess was an honest representation of what the fans high in the stands were seeing. And a casual viewer might think my tweaked Photo 3 looks prettier, but it has flaws like posterization and graininess. Notice the players thigh in the background. Television professionals try to avoid such flaws.